Here's my first attempt at saran wrap nails. Yup, I've been attempting lots of different nail art so lots of firsts for me. I actually saw this design months ago but forgot about it until recently when I came across this video and liked how doable it was. I also saw Jen from ThePolishaholic's submission for the Picture Polish contest after I did these nails and I really loved her saran wrap mani color combo. I might try it next time. I was fascinated by the fact that there was something readily available in the kitchen that could be used for nail art. Needless to say, I got the cling wrap and tore off a huge piece and happily trotted to my desk where I began to work on this super easy and fun design. This design is so easy to achieve - almost effortless and if you dab off too much polish, you can always go over with another coat. How to achieve this look: paint your base color, let it dry, paint over with another color, quickly scrunch up a ball of saran wrap and dab lightly over the wet polish. Or of course if you prefer to see how it's done, you can always watch the video. I used The Face Shop - GR501 (light blue) as the base for my thumb, index, middle and little finger and The Face Shop - PP402 (pink) as the base for my ring finger. Then I used the pink on top of the four fingers and blue for the middle finger. I did use Essie - The Girls Are Out to layer over my thumb. I really liked the shimmer!! But I thought it was too dark and I didn't want to waste the polish by dabbing most of it away so I switched and used the other pink. Here I used Essie - Play Date as the base and The Face Shop - PP402 (pink) as the base for the ring finger. Then I used Orly - Charged Up to layer over Play Date and Sally Hansen - Mint Sprint over the pink polish. I'm not too sure I liked the accent nail since it was a lot darker than I expected and didn't quite complement the purple nails. I asked my sister whether I should layer glitter over my nails and her reply was: I will always choose glitter over non-glitter. That was that. 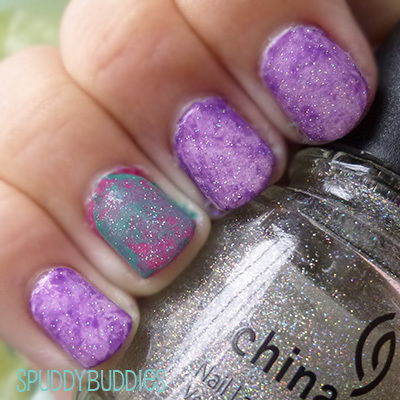 I layered China Glaze - Fairy Dust over my nails. Do you like these saran wrap nails with glitter or without? Would you try saran wrap nails? Oh neat! I had never heard of using Saran wrap for nail art. They came out really pretty! Super cute! I love the colours you chose for this. :) :) I also agree about the glitter - glitter makes everything better! Thanks Karla! I love your link party! This is a really fun tip! My daughter loves doing her nails, and is going to try it. We chose you at the Dare to Share Feature of the Day. Here is a link to your feature. 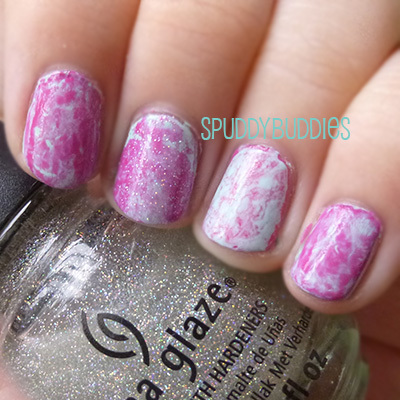 http://www.pamspartyandpracticaltips.com/2013/08/saran-wrap-nail-art-feature-of-day.html Thanks so much for linking up!